The Department of Intellectual Property (DoIP), Ministry of Economic Affairs in collaboration with the World Intellectual Property Organization (WIPO) conducted a National Seminar on Patent Cooperation Treaty (PCT) on 20 and 21 March 2019. The National Seminar is a part of the Preliminary National Interest Analysis conducted by the Department for the possible future accession of the PCT. The PCT is a WIPO administered multilateral treaty that simplifies the different procedural requirements for patent filings in each of the member states by reducing the administrative formalities and associated costs. The objective of the Seminar is to explain and disseminate the procedure of the PCT system to our local inventors and stakeholder as well as taking into account their views and opinions for the future accession to the PCT. In addition, the National Seminar is also aimed at creating awareness and publicity on the international filing of patent and the PCT system. To understand the PCT system and its cost and benefit from the expert’s point of view, Ms. Anjali Aeri, a Counselor from the PCT Legal and International Affairs Department, WIPO visited the country to facilitate the National Seminar. Bhutan joined the WIPO in 1994 but the institutional setup for IP Registration System came into effect with the enactment of the Industrial Property Act in 2001. Today, the Department has in place full-fledged registration system for the Inventions (Patent), Designs and Marks (Trademark, Service Mark and Collective Mark). A Patent is an exclusive right granted for an invention which is a product or process that provides a new technical solution to a problem or offers a new way of doing something. The Department registers inventions which are new, having inventive step and are industrially applicable in line with the Industrial Property Act of the Kingdom of Bhutan, 2001. A successful registration of an invention gives the owner a set of exclusive rights to stop others from making, using, selling, and offering for sale and importation of the product without his/her authorization. Like any other physical assets Patent can be licensed, assigned or transferred in succession. The term of patent protection is 20 years from the date of filing. The rationale for adopting patent system is to grant legal protection to enable the inventors to recoup their investment and encourage them to commit additional resources for further innovation. This in turn is expected to spur economic growth, create new jobs and industries, and enhance the quality and well being of our society. However, there is now a growing sense of urgency to further strengthen the system to better serve the future needs of our potential inventors and innovators. 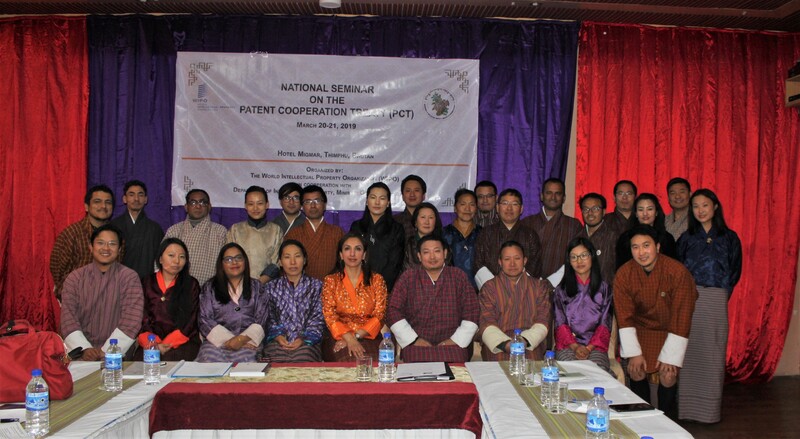 Bhutan stands ready to further collaborate in areas of policy development to harness the full potential of global intellectual property protection systems and services for national and enterprise development. The PCT relies on the principle of harmonization of the different procedural requirements in each of the Member Countries by reducing the administrative formalities and cost of filing of patent applications in contrast to the conventional method of having to file separately in different countries. The PCT system accepts filing a single international patent application with a single fee and currency (Swiss Francs) and single language (English). During the Seminar, the potential local inventors and stakeholders were informed on how the PCT System offers them a better route for obtaining patent protection in multiple countries. In addition, it was explained that the PCT system is beneficial to both the patent applicants and National Intellectual Property Office because of the uniformity in the formality requirements, the international search and preliminary examination report and the centralized international publication. Further, the participants were also informed that the objectives of the PCT are generally to facilitate the attainment of larger national goals such as the progress of science and technology, providing optimum legal protection of inventions, facilitating the access by the public to technical information and, fostering and accelerating the economic development of the country. A separate session was also held between the Officials of the DoIP and the WIPO Counsellor to discuss the common areas for collaboration, such as to conduct seminars and capacity building workshops in future, experience sharing on PCT with other member countries and on WIPO’s possible legislative assistance for Bhutan.